You took issue with a story published on the cbcnews.ca website entitled “Why some Venezuelans fear Maduro is selling them out to China” written by Ottawa-based reporter Evan Dyer. You corresponded directly with the reporter, and after a few exchanges you directed your complaint to this office. Yes, it was a lively exchange I had with Evan in which he regurgitated far-right talking points about Venezuela, Ecuador and much else. One of many highlights was when he insisted that he does not work for Canadian state media. Who owns the CBC again? Another highlight is when he emailed me a tweet about Maduro having a meal in a fancy restaurant. Evan said it was nice to see that not all Venezuelans were starving. I replied “Does Julio Borges look underfed to you, or your source Diego Arria, or Leopoldo Lopez, Henrique Capriles or any of the other Venezuelan millionaires the media holds up as heroes?” I added that if he cared even a tiny bit about Venezuelan living standards he’d oppose economic sanctions. Actually, it’s very easy from the “comfort of capitalist Canada” to applaud Trump (and his accomplice Trudeau) as they deliberately make Venezuela’s economic crisis much worse. I repeatedly asked Evan why he was ok with Trump making Venezuela’s crisis worse. He always evaded the question. Also, Venezuela is not a dictatorship. The easiest way to tell is to read Venezuelan newspapers or watch its TV on any given day, and in particular during the presidential campaign in May, but pinning the “dictatorship” label on it as Evan does is crucial to rationalizing economic attacks on it, threatening it with military assault, or openly inciting its military to perpetrate a coup – all things Trump and other US officials and politicians have done. Incidentally, many of the best things about Canada (its health care system, unemployment insurance, public pensions) have often been derided as “socialist”. It seemed to me during the exchange that Evan has nobody to debate with at the CBC about foreign policy in general, and Venezuela in particular, who is to the left of Donald Trump. You had several concerns about the piece. Your overall criticism is the lack of diversity of opinion and voices represented, since the article presents a negative view of Venezuelan leader Nicolás Maduro, and places the dire economic hardship of the country at his feet. You believe this is a biased and right-wing view, widely shared by most media. You suggested some other “independent journalists” who should be consulted and quoted. You said you found it “amazing” that Mr. Dyer wrote “an entire article about possible loans from China without saying a word about US economic sanctions on Venezuela.” You consider those financial sanctions devastating and say they have cost the country 6% of its GDP. I know a lot of emails flew around between Evan and I, but I summarized my complaint in a short email to you, and there is something very important that you failed to mention above. In addition to the “independent journalists”, I also pointed you and Evan to Venezuelan opposition sources. Francisco Rodriguez (an economist aligned with Venezuela’s opposition) has commissioned by the opposition-aligned pollster Datanalisis showing that financial sanctions are opposed by a majority of Venezuelans. Datanalsis is, by a huge margin, the most widely cited Venezuelan pollster in western media as I’ve confirmed through a Lexis Nexis search. So even by the (biased) standards the CBC and the rest of the western media have set for reliable polling in Venezuela, it has ignored a perspective shared by Venezuela’s majority. According to Datanlaisis, a majority also disapprove of opposition leaders lobbying foreign banks not to lend to Venezuela. The CBC, like the rest of the western media, is so extreme in its hostility to Venezuela’s government, that even opposition-aligned sources are ignored when their findings don’t support the US government’s attacks on Venezuela. US policy (aped by Canada) for the past seventeen years has been to back the most hardline sectors of the opposition. You stated that one of the independent journalists you mentioned confronted Diego Arria, a former Venezuelan representative to the UN, regarding his support for the 2002 coup which “briefly installed a US backed dictatorship under Pedro Carmona.” You were concerned that he was quoted in this story without mentioning this fact. Those “pro-government perspectives” are shared by 25% to over 50% of the Venezuelan public (depending on what exactly is asked) according to an opposition-aligned source, a pollster the western media has very selectively cited in thousands of articles (according to Lexis Nexis) to bolster US propaganda against Venezuela. 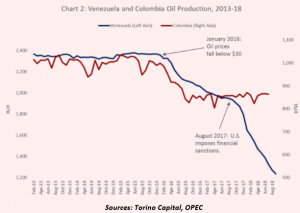 Regarding the 6% of GDP estimate (the impact of Trump’s financial sanctions that were imposed in August of 2017) that was based on Francisco Rodriguez’s observation of what happened to Venezuela’s oil production as soon as Trump imposed financial sanctions. See the chart below. According to a Lexis Nexis search done two weeks after Rodriguez’s piece came out there is no mention of it in any corporate media. Rodriguez was an advisor to Henri Falcon, the main opposition presidential candidate who (defying US threats) ran against Maduro in May. During the campaign, Rodriguez also had to fend off crazy allegations from opposition hardliners that both he and Falcon were in cahoots with Maduro. In fact, on twitter, Evan’s source, Diego Arria, lashed out at Venezuelans who were going to vote for Falcon. Evan’s argument is repulsive even if it were true. Can I assault a cancer patient lying in a hospital bed and defend it by saying “His illness predates the beating I inflicted on him, and besides, I didn’t give him cancer”? Moreover, in 2015, Obama imposed “targeted” economic sanctions on Venezuelan officials by officially declaring Venezuela an “extraordinary threat to the National security of the United States” which is ludicrous. If the US imposed “targeted” sanctions on top Canadian government officials by declaring Canada an “extraordinary threat to national security” I don’t think I’d need to convince anyone with a shred of common sense that it would have a serious impact on Canada’s entire economy. Sanctions did not force Venezuela to draft a budget that could only be sustained by producing 2.5 million bpd of oil at $160 a barrel. Sanctions did not cause oil production to fall to 1.2 million bpd — the lowest rate in 60 years. Sanctions did not force the Venezuelan government to allow up to half the food it imports to rot on the docks through sheer incompetence. Whatever the real percentage that rots, gets stolen, smuggled to Colombia etc..Trump (and Trudeau) clearly want sanctions to prevent the rest of it from reaching Venezuelans. Trump and Trudeau want to starve the government of the funds it uses to retain the level of support it has (at least 25% judging by an opposition-aligned source like Datanalisis which also says that’s about the level of support for all the main opposition leaders). In the case of Venezuela, I don’t agree with a definition of balance that means giving equal weight to regime apologists who deny there is a humanitarian crisis, or deny the very obvious responsibility of the ChavezMaduro government in causing it. In fact, Evan gives zero weight to Venezuelan opposition sources when they contradict the claims of Venezuelan hardliners and the Trump administration. I find it remarkable that you managed to miss that point which I made in my complaint. …while the facts are here, and other perspectives are present, it is the tone and choice of language that pushes this outside the realm of analysis and puts it within the boundaries of opinion. The word “spineless” in the headline sets the tone and frames the debate in a way that can only be described as opinionated. Looking for “points of view” that aren’t “opinionated” is an Orwellian task. It appears that provided the “analysis” has a “point of view” that is sufficiently respectful towards the Western Establishment, balance can be disregarded while the piece still gets tagged with a pseudo-objective “analysis” label. You believe the characterization of the Maduro regime in Mr. Dyer’s piece and in much of CBC’s coverage aligns with right-wing pro-American positions. You posed as alternative sources journalists you say are independent. That is your assessment. CBC reporters are not obliged to come to the same conclusion based on their work and the organizations for whom they work, like RT. I pointed to Caracas-based journalists who work for VenezuelAnalaysis.com which is reader-supported. I pointed to Mark Weisbrot, a US economist with CEPR which is a progressive think tank that receives no money from any government. I pointed to Mike Prysner who debated Diego Arria on RT. And, as I’ve already said repeatedly, I pointed to Venezuelan opposition sources. You defended the fact that Evan’s “analysis” completely ignored US sanctions on Venezuela by saying that he was broadly focused on China’s “geopolitical” ambitions in the Americas. The context is a geopolitical one – the fact that China has been using heavy investment in strategic areas to gain some concessions from the recipients which align with its interests. Mr. Dyer goes on to provide background as to why the country’s situation is so desperate. You believe sanctions should have been part of it. In a broader take on the various forces at work in the country, that level of detail may have been necessary. In this case it was not. All the Venezuelan government’s outstanding foreign currency dominated bonds are governed under New York State Law. Venezuela is now outlawed by Trump from restructuring that debt. A major Venezuelan state asset (CITGO) is a corporation based in Texas that is prohibited by Trump from sending profits and dividends back to Venezuela. It’s very obvious why that would make Maduro’s government more eager than ever to seek financing from China. Arguing that an “analysis” of Venezuela’s financial relationship with China (see the headline to Evan’s article!) was either too broad or too narrow to mention US sanctions would be silly. You made both those contradictory arguments at once which is even worse. You rejected the objectivity of various human rights organizations like Amnesty and Human Rights watch – both of whom have been highly critical of the Venezuelan government’s actions. The United Nations High Commissioner for Human Rights has stated that crimes against humanity may have been committed by state forces in Venezuela and expressed concern at “the erosion of democratic institutions” in the country.” You may question all these sources. It is not a violation of journalistic policy to be able to state that this is, as Mr. Dyer characterized it, “a corrupt government that seems willing to go to great lengths to remain in power.” There is a fairly significant consensus that this is the case. The easy comfort you take in a western elite “consensus” conveyed by prominent NGOs, and your apparent lack of interest that a CBC “analysis” challenge it, or even acknowledge that it has been challenged, is alarming. Consider the worst crime of the Twenty-First Century (thus far), the US-led invasion and occupation of Iraq that killed at least half a million people. The contribution of those groups you mentioned above to preventing it was useless. Aside from admirable UN dissidents (like Scott Ritter) who were ignored, the UN role was much worse than useless. It was a key collaborator. By the way, Alfred De Zayas is an outspoken dissident within the UN in the case of Venezuela today. Very recently an aggressive and deeply racist proponent of the Iraq war and other crimes, John McCain, was lauded by the entire western establishment as a wonderful person. Officials from Amnesty and Human Rights Watch contributed to that vile spectacle. Amnesty has refused to denounce US economic sanctions against Venezuela. It even refused to denounce statements by Trump and other threatening military attack and trying to incite a military coup. How is that a defensible position for a human rights organization to take? Ken Roth, head of Human Rights Watch, wrote in 2015 that the United States is the “the world’s most powerful proponent of human rights”. His outfit was shown to have a revolving door with top US government officials. I asked CBC management about plans to send journalists to Venezuela – it is on-the-ground reporting that allows for the fullest picture. CBC was last there in 2013 and Paul Hambleton, Director of Journalistic Accountability, tells me they have been unable to secure visas since then. [Venezuelan] government has been very restrictive with visas for quite a few years now – often denying outsiders but generally allowing the permanently-based media (eg us) to renew, although sometimes in a slow and tortuous way. The pool in Caracas has probably dropped a bit because of that. And sometimes journalists are coming in unauthorised with tourist visas. Given the government’s view of antagonism from the foreign media, it’s perhaps not surprising. Not surprising indeed. I wonder how many Venezuelan state journalists would be working in Canada if Venezuela were massively harming Canada’s economy, collaborating with other governments threatening to invade Canada, funding groups involved with violent protests, and openly inciting our military to perpetrate a coup. I won’t hold my breath waiting for a CBC “analysis” that considers that perspective.